It’s not a difficult equation. A good teacher will generally lead to a good educational outcome. So how do you get good teachers? How do you persuade the best graduates to pass on their skills and passion to the next generation? Some of that’s going to be about money. Much of it is about status. The Global Teacher Status Index looks at the way teachers are perceived around the World. One of the best ways this information was captured was to ask respondents what profession teaching is most like. In the majority of countries surveyed (for example, New Zealand, Spain and the Netherlands), teachers are considered similar to social workers in terms of their profession. In China they are considered most like doctors, in France and Turkey, they are considered to be most like nurses, and in the USA, most like librarians. In spite of levels of salary, the respect also correlates with respondent’s views on whether they would encourage their children to become teachers. In Israel, for example, on 8% of respondents said they would encourage their children to become teachers – in China that number was 50%. In Greece the status of teachers is high, but their compensation is low. On the other hand, in Germany and Switzerland, even though teacher earnings are relatively high, respect is low. The Global Teacher Status Index makes for fascinating reading. It’s a shame Australia wasn’t canvassed in the survey – I’m assuming we’re not a million miles away from New Zealand for these purposes, but doubt we’re entirely similar. It is interesting that there was not a high degree of correlation between the status of teachers and educational results. The way teachers are perceived, how much they are paid these are part of a much more complex tapestry. The countries which have well-respected teachers, decently paid and working within a funded system do well. In poorer countries teachers status is high – probably as it is seen as a viable alternative to relative poverty – but that doesn’t correlate with great results when compared internationally. 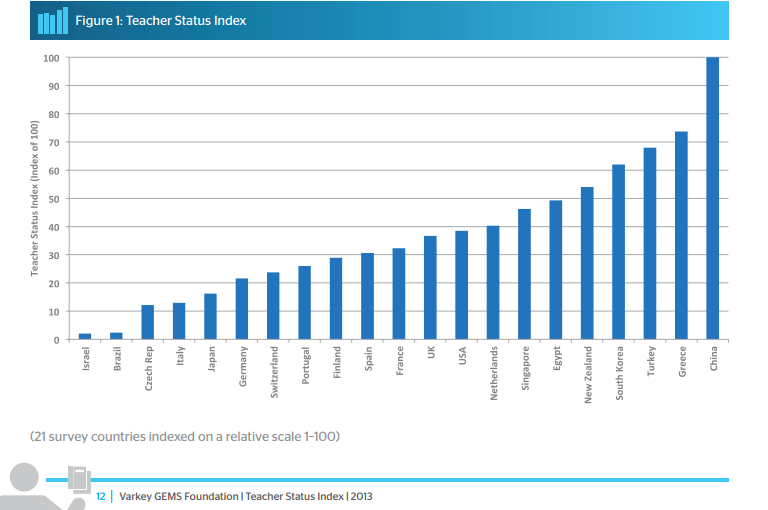 So in Turkey respect for teachers is very high, but the educational outcomes are poor. While the Report clearly assesses the way teachers are perceived and shows it isn’t linked to salary, at least not alone, it does not suggest a way to improve the way teachers are perceived and so encourage more people to take up teaching. That, as with most educational issues, requires some long-term planning from the government to bring about a change that will take decades to bear fruit. For all the details see the website and download the PDF. For an interactive summary see here.